Rights and Responsibilities by Edith Sizoo 16 11 2012 It is time for an international text, a Declaration to safeguard the environment and ensure wellbeing for present and future generations…. The Waitangi Tribunal claim for Māori interests in water reminds us that water, is a taonga, a treasure guaranteed to Māori. If Mighty River Power is sold Māori will not be able to pursue their Treaty interests because they cannot claim against private investors. The Prime Minister says water cannot be owned but government allocates the right to use water. Those who have an allocation effectively own the water they take and use. Māori Interests in kaitiakitanga are for use and care of water for the benefit of people now and in the future. Some Māori interests are commercial and include the prospect of owning power assets. With a stewardship approach we can shift the argument about the right to own, to the responsibility to care for water so that future generations are assured of access to water. Do government and private companies have a responsibility to provide electricity at a fair price? Does stewardship apply to the commitment of companies to make profits? 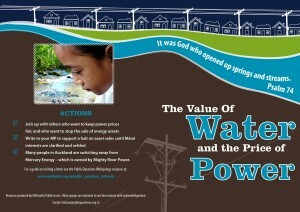 How can we contribute to stewardship of water resources and sustainable power generation? Where energy bills are causing hardship and harm, what can people do? Which agencies are responsible? The pricing of power is now tied to profit, not to providing a service. Trade agreements protect profits for investment. The TPPA will lock in regulations for profit and even allow companies to sue States which have regulations to keep prices down for essential services. What are the likely effects for power supply, food, health and environment? If water is part of property, including Māori property, are power companies entitled to have water for free?